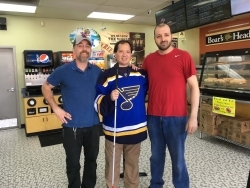 Two blind board members of the Spirit of Discovery Park reached out to the Kirkwood Deli and Convenience to show their appreciation for their kindness, and formed a bond of friendship. St. Louis, MO, February 26, 2018 --(PR.com)-- Recently the Kirkwood Deli and Convenience, owned by Mike Bahour, has become a sponsor by generously donating funds for the Dash at Dusk 5K event. Annie Donnell, totally blind; and Elton Thomas, legally blind, both serve on the board of Spirit of Discovery Park hosting this event. Mike was interviewed over the phone by Annie, and Elton visited the deli for a video/photo shoot to show gratitude for Mike’s generosity. The Kirkwood Deli has been open for sixteen years. Mike explains how he just started eight months ago. Prior to working at the Kirkwood Deli, he gained twenty-five years of experience in the food industry including gas stations, various convenience stores, and restaurants. Bahour pursued this opportunity because the prior owners were about to close the restaurant since the lease was for sale. Mike took advantage of this great opportunity; and not much work had to be done to transition this store in to Mike’s vision. Currently, there are six staff members of which three worked prior to the transition, and the other three were recruited within the past few months. When Annie asked Mike what defines your success? Bahour responds, “The quality of meat.” The Deli is known for Boar’s Head meat used on gyros, and Philly cheese Steak sandwiches. The gyros served are known as, “The king of gyros” in the St. Louis area. Twenty percent of sales are generated from gyros, twenty percent from philly cheese steaks, and the rest of the sales come from Boar’s Head meat and other sandwiches. Bahour first heard about Spirit of Discovery Park from Jamie Vann, president of the St. Louis Recreation Development Group Inc. a non-profit organization developing the park, as she visited the store one day to raise awareness for the 5K Dash at Dusk event. Mike expressed how this is a worthy cause to support, “You always want to be involved in the community and support good events.” Mike also expressed the benefit of how the sponsors of this event will have their logo printed on every t-shirt the participants will receive, and how the logo will be displayed in a flyer around the time of the event. Elton Thomas visited the Kirkwood Deli and Convenience on Sunday February 18th, 2018 to do a photo/video shoot. This deli store is without a doubt a community and family friendly place. Inside the store was a fresh smell of delicious deli-ness and a radiant glow of clean surfaces. The staff is super friendly and professional, and Mike in person is a friendly and humble man. Mike had asked Stephen O’Bay to do the presentation of the store on camera. Stephen gave a great presentation and covered most of the information already mentioned except the house accounts. The house accounts are for parents who can set up a prepaid visa at the store, and then their kids can come get what they need without having to carry cash. In the final interview, Stephen expressed his ideas about inclusion for people with disabilities. Stephen’s mother is retired after serving as a physical therapist in the Parkway School District, and Stephen’s pride about his mother shined as he spoke about her. Stephen himself is a senior social work major at the University of Missouri St. Louis, but needs to go back and finish. Stephen explains, “I’m so close, but feels so far away.” Stephen concluded the interview by expressing how supportive Mike is when it comes to staff who want to go back to school. The Kirkwood Deli and Convenience is surely a great place to be, eat, and shop. Lisa Huseman Hale, owner of Z Total Body will be warming our athletes up prior to the event, the Bubble Bus will be accompanying us providing music and a Bubblefinish for every Body crossing the finish line. Friendship Brewery will be greeting those 21 & older to a tasty beverage with a congratulatory Cheers! Cheer on these athletes as they compete on a certified 5K course being professionally timed by the Fleet Feet Sports. **The Virtual Race is available Now thru May 5th! Running shirts to all those who participate. Logo Shirts Guaranteed Through: Friday, April 27, 2018. Schedule May 6th @ 370 Lakeside St. Peters, MO. 3:00 PM- 3:45 PM – 5K “Day Of” Registration. Race starts at 4:00PM afterwards is awards ceremony. Spirit of Discovery Park is a local, nonprofit, organization established in 2016. Its Board of Directors has taken on the monumental task of developing a 100% inclusive amusement park specifically designed for people with physical and mental disabilities and special needs. The destination will be located in the St. Louis metropolitan area and will have rides and attractions, a greenhouse, and an ice rink welcoming every Body in tennis shoes to hospital beds. For more information please visit www.SpiritofDiscoveryPark.com. Open seven days a week: 500 West Essex Ave, Kirkwood MO, 63122.